We are Scotland Food and Drink Award Finalists, which is a fantastic achievement for a new business – we are not yet one year old! It was a great honour to be in the distilling category alongside Isle of Harris Distillers, Tamdu Whisky and Isle of Skye Distillers but no surprise to any of us that Harris Gin ultimately won the award and also the over-all best product award. 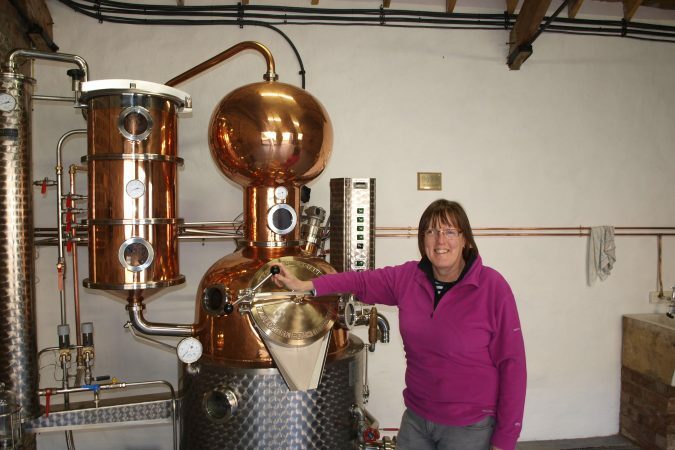 This industry stalwart continues to set a high bar for the rest of us which can only be a good thing for Scottish gin, and ‘brand Scotland’ in general. 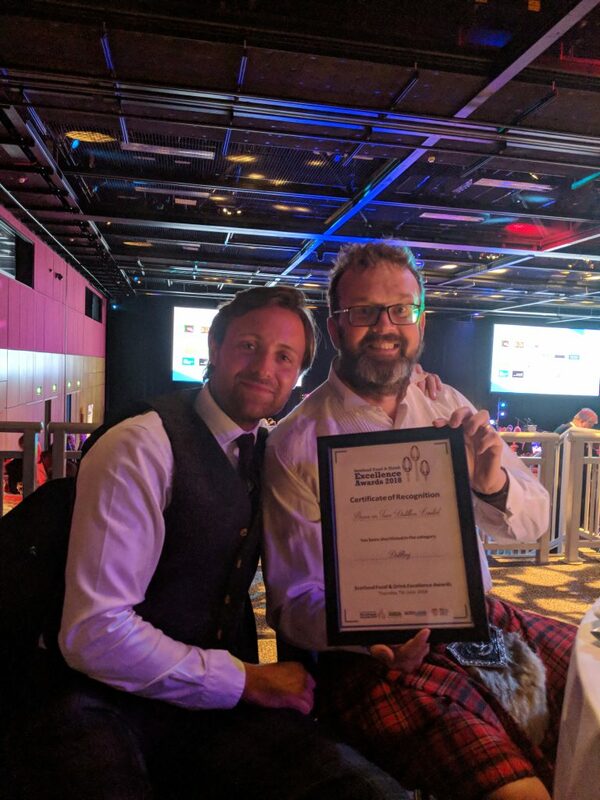 It was thrilling to be part of the awards ceremony at the EICC in Edinburgh and a treat for directors, Emma and Niall to throw off the jeans and trainers in exchange for a frock (Emma) and kilt (Niall). Sadly we couldn’t take the whole team this time! 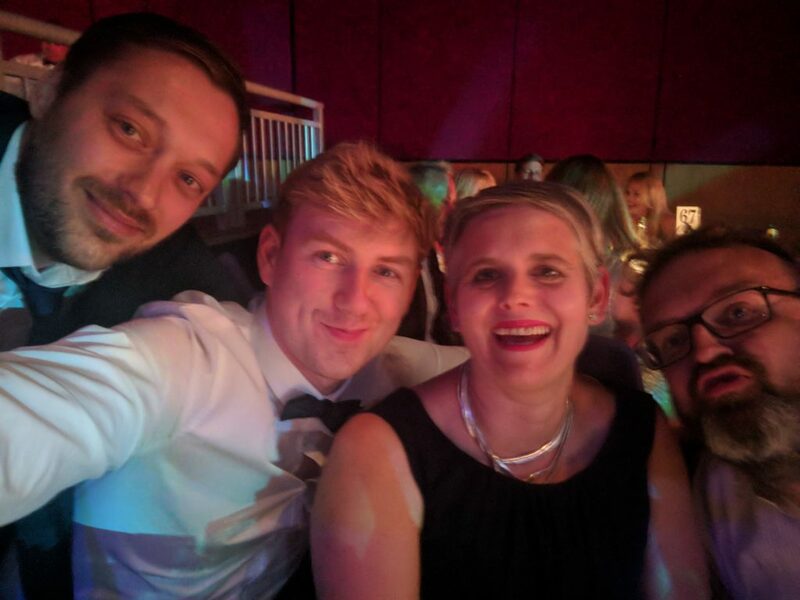 Selfie with Mark and Darren from Print & Sign Centres! Boss Hogg is working that pout. We were kept entertained at our table by the lovely lads from Print & Sign Centres who were event sponsors and were delighted to bump into James Strong from Great Brink who designed our new tasting room. The event was hosted by TV chef and Strictly afficionado, Simon Rimmer, who ensured that no prize winners attempted lengthy speeches which would hold things up. Dinner was delicious – Luss smoked salmon, Scottish lamb from Aberdeen and a delicious dessert of Fife blueberries with baked cream. 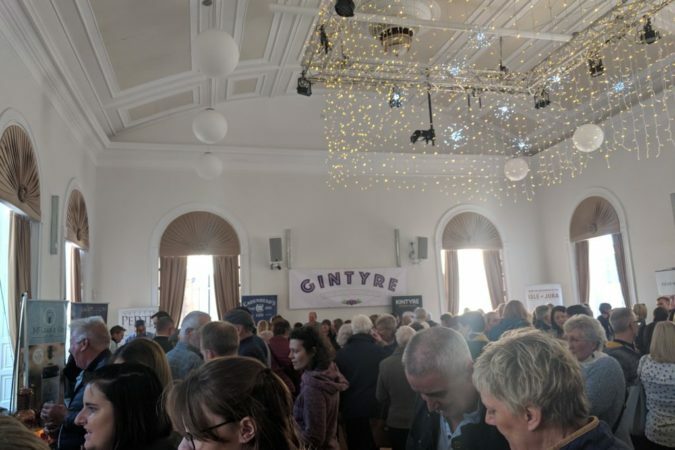 The whole evening was a fantastic celebration of what Scotland has to offer in terms of food and drink and it was inspiring to see what other producers are doing. There’s no doubt that ‘brand Scotland’ is flying high just now and we are delighted to be doing our bit in the world of craft distilling. 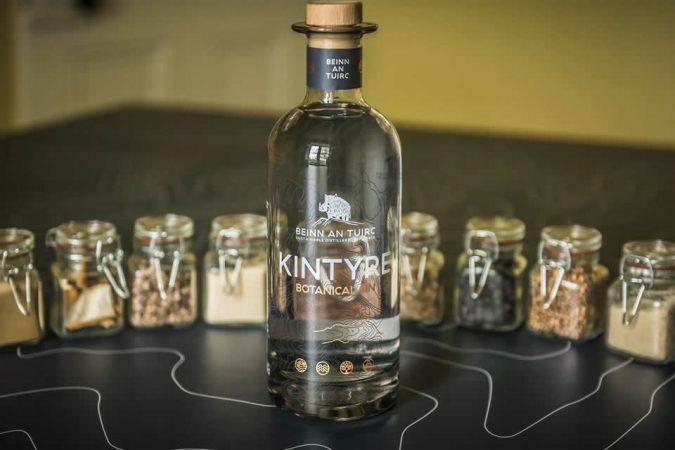 We are so proud of the provenance and quality of our product and are thrilled Kintyre Gin is holding its own amongst the best in the industry. Tagged with: brand Scotland, craft gin, Scotland Food and Drink Awards 2018, Simon Rimmer, Strictly Come Dancing.